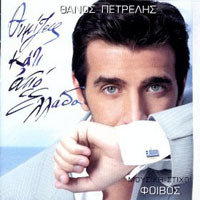 This page contains a translation into English of the lyrics to the Greek song Η Ωραία, which was sung by Thanos Petrelis. This translation was based on the version appearing on his album Θυμίζεις Κάτι Από Ελλάδα (Thimizeis Kati Apo Ellada). Also included is a a pronunciation guide for the Greek lyrics so you can sing along if you like. Thanos Petrelis is a Greek vocalist who appeared on the pop music scene in 2003 as a result of his performances on the television reality show Fame Story. The album "I Oraia" comes from was his second, which was released in 2005. In the English translation column, items enclosed [in square brackets] are comments by the translator to clarify the meaning of the phrase. This translation was created by Amartia. Amartia is an award-winning bellydancer. She has traveled to compete all over the United States. She is the 2008 Jewel of the Nile and the first place winner for veil dance from Arabian Nights. More recently she was one of the 23 bellydancers chosen to compete in the first season of a reality web-show- Project bellydance! Amartia, Extravagent Entertainment in Maryland has also been featured in Fuse Magazine, written an article on Greek bellydance for Zaghareet, and was the July 2012 Bellydancer of the Month for Brandon’s Oasis. PHOTO CREDIT: Photo by Anton Marx.